The unit plan that produced some truly heart-warming stories of the children at our school. My classes will be migratory for next few months. I have been travelling around the school with iPad trolley, router, switches, cables, speakers, AppleTV setting up each class to base myself a different classroom environment each day. 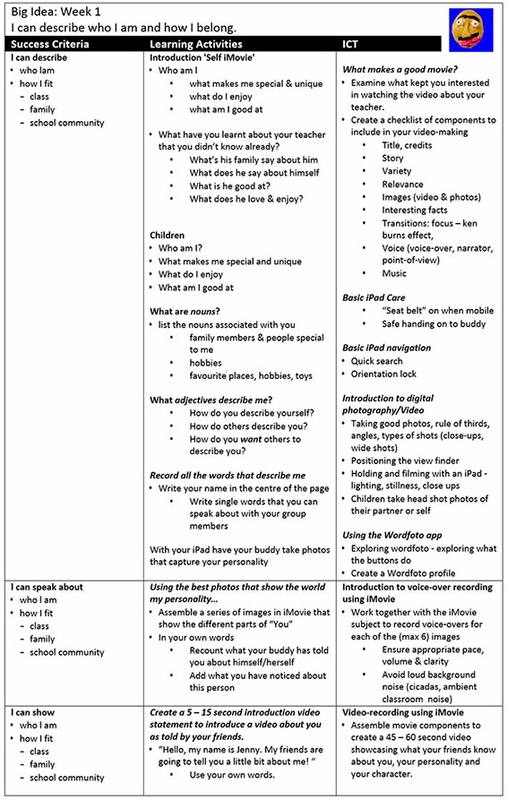 Inspired by a Keynote presentation Jaq Maindonald showed about herself in our Week One classes, I got the idea to do a similar thing using iMovie on an iPad. It was my first exploration of the app. I asked my family members to say something about me as they looked at the summer holiday pictures I dropped onto the time line. I spoke to the camera in our lounge then added music. Here's my starting point and the results of the childrens' efforts below it. Here's what we produced to show just who the learners in Room 15 are. We talked to our friends about ourselves, and then our class mates described who we were on these videoposts. Here's the link to the planning and pedagogy behind this work. Wow - you guys are so lucky, making really cool instruments out of just about anything. Very clever, very cool and lots of fun by the look of it. I'm guessing you used your "Green Thinking Hats" for this learning. Well done all from Mr M.